VENICE BEACH - From the concrete jungle of New York to the sunny beaches of L.A, the Boost Mobile Elite 24 concluded the summers AAU schedule with an All-Star game in Venice Beach. While we didn’t have Billy Hoyle and Sidney Deane running the courts, we did have the top 24 high school prospects in the nation. The event kicked off Wednesday with a Midnight Run at the Hanger Athletic Xchange, also known as the HAX. 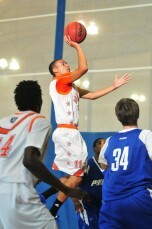 Starring in the game were the elite high school prospects along with some of the youngest talent the NBA has to offer. Reigning Rookie of the Year Tyreke Evans teamed up with DeMar DeRozan, Brandon Jennings, Bobby Brown and recent #1 draft pick John Wall to take on the youngsters. While the game was full of crossovers and fadeaways, one in particular has gotten fans across the internet buzzing. Austin Rivers, the 6’4 guard from Winter Park High School in Florida, crossed up recent #1 draft pick John Wall and took it straight to the basket for a lay in. Regardless of the big play, the pros dominated most of the games they played in. The second day of the event offered a training and combine session followed by a scrimmage. Conducting the training session was current Denver Nuggets strength and conditioning coach, Steve Hess. Now, if you’ve never met the guy, all you need to know is he is one of the most intense people you will have ever met. While most players struggled with the core exercises, one particularly stood out, 2011 point guard Myck Kabongo. Ending the combine session was Brandon Jennings discussing his struggles to get to where he is, as well as reminding the players to keep an open mind when it comes to signing a shoe deal. While no one completely dominated the scrimmage, there were a few standout players. 2012 prospect Shabazz Muhammad did show off some of his strong inside moves. The talented wing-forward grabbed multiple rebounds inside showing off his strength, which lead to easy put backs. The other standout was 2011 Findlay Prep point guard Myck Kabongo. Myck displayed his advanced dribbling skills and excellent court vision often making passes you wouldn’t think possible. The third day offered the skills and dunk competition. 2011 guard Brad Beal of Chaminade College Prep School in St. Louis, Missouri, won the skills competition over Oak Hill point guard Quinn Cook. The dunk competition featured 8 contestants including Deuce Bello, Jahii Carson, Amir Garrett, Nick Johnson, LeBryan Nash, Norman Powell, Gabe York and Stephen Maxwell. Deuce Bello edged out local prospect Stephen Maxwell in the finals, although his most impressive dunk was in the second round when he teamed up with fellow Westchester Day player, Quincy Miller. Quincy, seated under the net, bounced the ball and Bello completed a full windmill over Miller to bring the Venice Beach crowd to their feet. Concluding the Boost Mobile Elite 24 event was the All-Star game on Saturday. Clear and sunny skies offered the perfect weather for an outdoor basketball game. While the crowd on Friday was much more laid-back, Saturday’s crowd created a much better atmosphere. There was a certain buzz in the air throughout the game. The game offered a typical All-Star feel, big dunks and little to no defense, except in the final minute. Kyle Wiltjer, who committed to Kentucky at halftime, was the games leading scorer with 20. In the end, The Raymond Lewis East Squad beat The Marques Jackson West squad 131-128. Stay tuned for more interviews with Duke recruiting targets which will be feature this week in BDN Premium, your inside source for on the spot coverage Duke Athletics.